DANGEROUS GAMES: a new e-book in December! A new story is coming your way this December! It's is Dangerous Games - a sequel to Mind Games. I know, I know: I said Mind Games was a standalone. And I wrote it as one, and you can read it on its own if you want to. But if you want more...now you can have it. There's more details on it on Books with Bite, here. AND the Mind Games trailer competition is underway! All you have to do is make a book trailer for Mind Games, and you could win a school visit by me. I've extended the deadline to the end of November, so there's still time. All the details are here. but does he really die? Sorry Kira: I took your comment down because of the spoiler about Mind Games! Hi... i just wanted to say that i am a huge fan of your work...i mean seriously, you got me hooked on books now! I can't wait to read "Dangerous Games!" 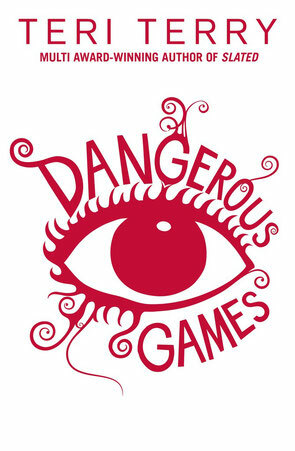 At the moment, Dangerous Games is e-book only. There might be a paper version at some point, but there might not be - it's up to my publisher. Dangerous Games is a novella, which means a little shorter than a novel (it's about 1/4 as long as my other books). Please tell me why this isn't a normal book? I hate ebooks!!! !